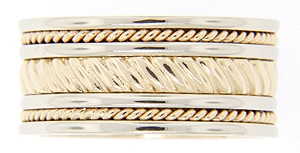 Diagonal designs and spiraling lines both in yellow gold ornament this 14K gold men’s antique style wedding band. 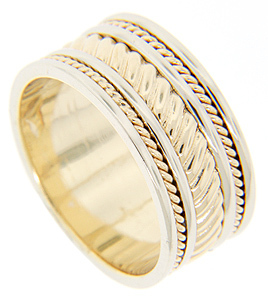 Smooth, polished bands of white gold are used as separators between the patterns. The wedding band measures 9.8mm in width. Size: 9. Cannot be resized, but we can reorder the ring in any size and in white gold, yellow gold, platinum and palladium. Price will vary depending on metal and size.